I got a new TV for the living room yesterday, instead of going to the jewelry show. I had a wild hair, seeing all the great deals on TVs due to the Superbowl, and decided to get a new big screen TV instead. While the screen is bigger, it takes up a whole lot less space than my other TV. My living room has been transformed. It feels soooo much bigger now that the windows don't have the love seat in front of them. 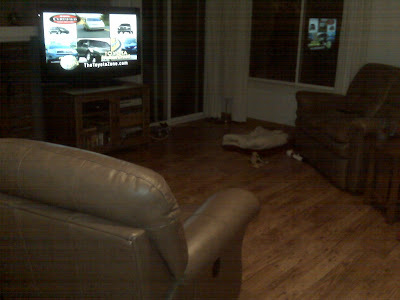 Now you can see the TV from both the couch and the love seat. Got a super bargain for the TV too, of course they've come so far low in price but, $750 for a 50" HDTV is kickass. KICKASS I tell you! Saturday night's game was fun, it's always funner when the Sharks win. Having club seats, row 10 is kickass too. Got a new Sharks jacket which I found out a day later is reversible. Jackpot! At first I thought that they did a really good job with the lining. Moxie and I enjoyed a nice run in the sun Saturday. It's been ages since we've run with the sunshine hitting us. Friday after work, I had dinner with my long time friend Priscilla. She braved the downpour from Union City to my house which she'd never been to before. We had a really nice dinner of appetizers at the Fish Market, one of my favorite places to eat. One of my New Year's resolutions is to hook up with old friends on a more regular basis. So far, Priscilla, and Adriana have met with me this month and of course you always wonder what took you so long. Thursday, Kurt and I had pizza at the Olive Garden. Now if you haven't had their pizza, you're missing out. That plus their endless salad is the perfect dinner for two. Bonus tip : eating at the bar means no screaming kids next to you. We were in part, celebrating the (2nd) diamond bracelet he gave to me. :) The first one was for New Year's eve, the other one, he just found in his front yard Thursday after work bringing the trash cans back from the curb. It's real 14kt white gold and diamonds. The diamonds are not nearly as nice as my first bracelet but what a miracle it was found at all. It was really dirty and the rain must have moved the leaves just right for a twinkle to catch his eye. I took my electric toothbrush to get the really packed dirt out of the undergallery. No scratches at all, and the clasp works very well. This leads me to speculate that perhaps it was dropped when Kurt's house got burglarized a couple of months ago. In any case, it looks lovely next to my other bracelet. Good thing your TV is under 55"
Lovely bracelt, BTW. I hope this is a good omen for you both.